If you’re looking to relocate your business to Slough or you’re interested in branching out to a new area and want to buy commercial property in Slough then read on. This guide will give you a rundown of the area, what you can expect from moving your business to Slough and what the general market is like. One of the best features of Slough is that it offers the buzz and diversity of the town centre, but also the proximity of beautiful riverside towns and villages. Slough is located 23 miles west of London it’s a great location for commuters, and that is perhaps why its home to numerous large international companies. Slough is a very diverse area and is home to many people from varied backgrounds. As of the most recent census data from 2011, a significant portion of the population is of immigrant origin, notably Pakistani and Indian. Polish is the second most widely spoken language in Slough after English at 6.2% of the population, followed by Panjabi and Urdu. Slough has a population of just over 140,000 people, meaning there is a very large and diverse consumer base in Slough for businesses that target retail markets. Slough is a major transport and business hub with close proximity to both London and Heathrow airport (with Gatwick, Stansted, Luton and London City airports also relatively close by). This is great for businesses, as it is a very convenient place for a company that requires a lot of travelling or meetings with international clients. Clients from all over the world can fly into any of London’s major airports and then reach Slough by train within minutes (or alternatively, you can offer to meet international clients in London and get there easily yourself). The current journey between Slough and London Paddington station is only of 35 minutes by train, and the change of train to other areas of London is very fast and easy. Additionally, the arrival of Crossrail is also having a very positive impact on Slough and its attractiveness to businesses. From December 2019, four Elizabeth line trains an hour in each direction will serve Slough station, allowing passengers to travel right through central London without having to change trains. Once this has taken place, the journey from Slough to Liverpool street, for instance, will only take 39 minutes. Demand for office space in Central London is competitive and occupiers are increasingly looking at locations outside of London with excellent transport links, a well-educated workforce and comparatively low rental prices, and Slough fits the bill for all of this. Slough has plenty of commercial and industrial business parks and locations, the largest and most famous being the Slough Trading Estate. Many businesses have headquarters or branches in Slough. Some of these properties even end up forming famous local landmarks such as the Mars factory, which has been making chocolate products and providing jobs to the local area for over 80 years. Slough is also home to two very big Tesco and Sainsbury’s superstores, the Queensmere Shopping Centre (containing over 120 shops and outlets), as well as several wholesalers such as Bookers and independents. There are several retail and business parks and other large companies such as O2, Lego and Mars, also have large offices in Slough. The close proximity to the airports makes it a major hub for business travellers and many hotels such as the Marriot and Premier Inn have locations in or near the airport. As you can imagine, all of this promotes Slough as an ideal location for a business, especially from an administrative prospective. Additionally, the excellent access to the M4, M40 and M25 motorways, makes it a very popular hub for logistics businesses. Slough is a great place to relocate your business from a retail perspective. With a major high street, as well as a shopping centre, a cinema, a bowling alley, many restaurants and more, there are plenty of reasons for the public to visit Slough for some retail therapy and indeed many people do on a daily basis. 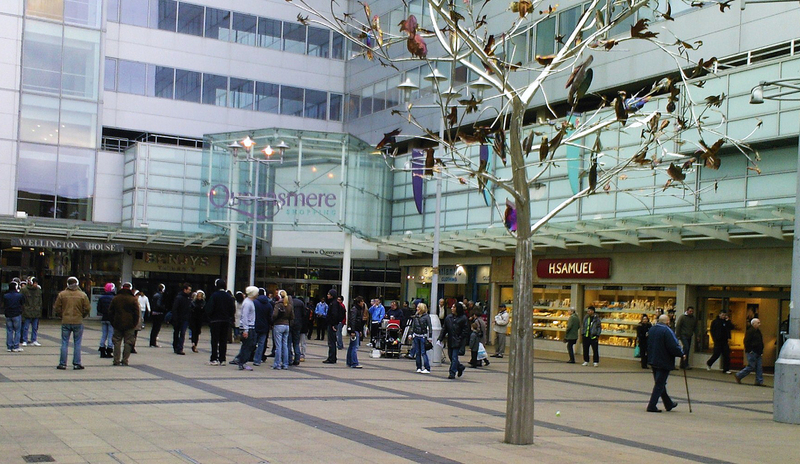 The Queensmere shopping centre has a healthy level of occupancy but there are usually a handful of available shops to let as individual businesses come and go. Consulting with a local retail expert is recommended to get a firm idea of the best options available as a retailer. There are also industrial and manufacturing possibilities in Slough, though obviously these require much more research and careful planning to be done. However, for administrative purposes, there are plenty of warehouses and office locations available. Superfast Berkshire was a scheme set up intended to improve broadband speed and coverage across the whole of Berkshire, including Slough, that only recently ended. This means that internet speeds are decently fast and any businesses that rely on a speedy and reliable internet connection should be taken care of. As you can imagine, for such a large, thriving business centre and major national and international transport hub, property in Slough is very valuable. Property prices rose faster than the national average in Slough during 2016, meaning property will probably be costlier than you might expect if you’re not local to the area. Hiring the services of a local property expert, such as Deriaz Slater, is advised to get the best available prices for commercial property, especially if you are not familiar with the area yourself.